Keeping an older adult’s mouth healthy is just as important as caring for the rest of his or her body. When seniors maintain good oral hygiene, they can reduce their risk of developing health conditions such as heart disease and Alzheimer’s. 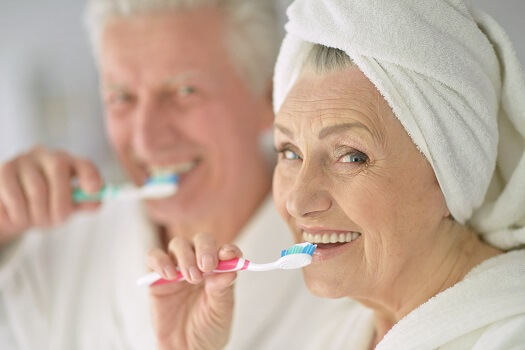 Here are some of the things seniors can do to maintain better dental hygiene. To make brushing and flossing easier, seniors should invest in electric toothbrushes, floss holders, and other alternatives that can make a big difference with their oral hygiene. Special bristle patterns can also make it easier for seniors to brush their teeth, especially adults living with arthritis and other bone diseases. Your loved one needs to use fluoride to prevent decay, damaged gums, and broken teeth. Make sure your loved one brushes his or her teeth two times per day and flosses daily. Seniors who want to remain healthy as they age can benefit in a variety of ways when they receive professional home care. Oshkosh, WI, Home Care Assistance is here to help your loved one accomplish daily tasks, prevent illness, and focus on living a healthier and more fulfilling life. Nutrient-rich foods can promote healthy teeth in older adults. Calcium is one of the best minerals for seniors because it helps them build bones and provides structural support. The more calcium your loved one consumes, the stronger his or her jawbone will become. Foods like salmon, broccoli, cheese, and low-fat milk can harden the enamel and increase bone density. Vitamin C is also good for dental hygiene because it can strengthen the soft tissue in the mouth, protecting against gum disease and tooth loss. When seniors smoke, their odds of experiencing bad breath, plaque and tartar buildup, tooth discoloration, inflammation of the salivary glands, tooth loss, and gum disease increases. Encourage your loved one to stop smoking immediately, and help him or her develop healthy habits to combat the urge to smoke, such as exercising, eating healthy snacks, taking up arts and crafts, or learning something new. In addition to poor dental health, smoking can also increase the risk of developing lung disease, blood clots, and memory loss. Older adults living with dementia need help performing the tasks of daily living. Oshkosh respite care professionals can assist seniors with a wide array of daily tasks, offering family caregivers the chance to focus on other personal responsibilities or take a break to prevent burnout. Whether it’s for a few hours a day or a few days a week, respite care is the perfect solution for family caregivers who are feeling overwhelmed. Although your loved one may be accustomed to a traditional water rinse, adding salt may enhance his or her dental hygiene. Just add a teaspoon of salt to the water to prevent bacteria from growing in your loved one’s mouth. The salt water will also increase your loved one’s pH balance. Even with the best dental care, seniors still need to have regular exams to determine if they are at risk of developing conditions such as oral cancer. A dentist can test for these issues and give your loved one advice on how to maintain good oral health in the senior years. Catching these diseases early on could also lead to successful treatments. In Oshkosh, home care agencies can be a great boon to seniors. With the help of the caregivers at Home Care Assistance, your aging loved one can lead a happier and healthier life. We offer a revolutionary program called the Balanced Care Method, which encourages seniors to eat nutritious foods, exercise and socialize regularly, and focus on other lifestyle factors that increase life expectancy. To create a customized in-home care plan, call us at (920) 710-2273.